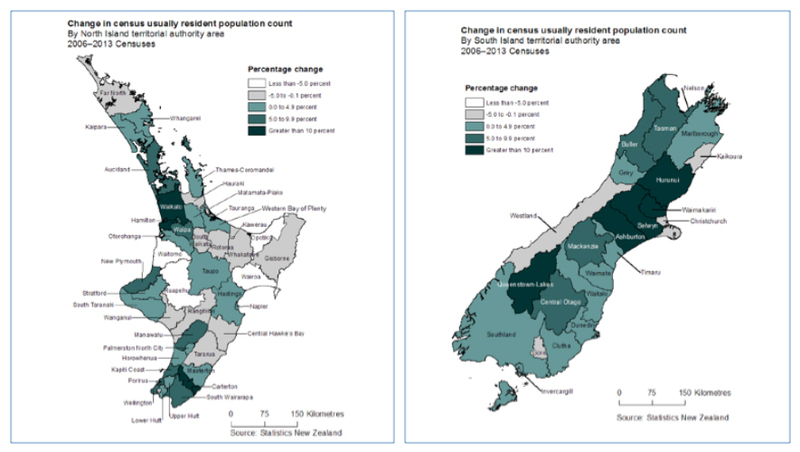 The two maps on this page were drawn by Statistics New Zealand (the originals can be accessed in a Hot Off the Press release available here). They show the percentage changes in the populations of district and city councils between the Census of 2006 and the Census of 2013, measured in five bands. The bands range from councils whose populations fell by more than five per cent (shown as the white areas) to councils where the populations increased by more than ten per cent (the darkest areas). The map shows most parts of the country increased their populations over the seven years, but there were twenty territorial authority areas with lower counts in 2013 than in 2006. This included the Far North and large parts of the central and eastern North Island as well as Kaikoura, Westland and Gore in the South Island. This pattern of population changes generally reflects different experiences of economic wellbeing in different parts of New Zealand in recent years. Similar patterns are found in countries all around the world. Struggling regions pose a challenge to the central government in each country for at least two reasons. First, they raise questions of equity about the range of public services and private opportunities available to citizens depending on where they are living and, in the case of children, where they are growing up. Second, the strength of a national economy depends on its regional economies. National economic goals can therefore be put at risk if large parts of the country are unable to prosper or find themselves caught in a downward spiral of population loss and local business closures, followed by reduced public services. Different governments have responded to these challenges with different policies for regional development. Even within countries, different approaches have been tried at different times. In New Zealand, for example, there have been governments who have appointed a Minister for Regional Development with a mandate to create partnerships for regional development. There have also been governments without a Minister of that title who focus on more general policies to support businesses or industries wherever they are located. Internationally, three strands can be distinguished in regional development policy. Central government might agree that all persons should be helped to develop their skills (through compulsory or post-school education in particular) and to use those skills where they are most rewarded. Such an approach often reinforces population decline in less urbanised regions as young people choose to move to the cities (or to larger cities overseas) for better education and employment opportunities. Central government might agree that all communities should be helped to share in the country’s infrastructure networks (such as quality local roads, efficient postal services and ultrafast broadband communications), regardless of where the community is located. For some areas, this is likely to involve subsidies from the rest of the country, justified as part of the country’s commitment to nation-building. Central government might agree that all regions should be helped to develop their local economy by identifying and taking advantage of existing and emerging opportunities. This approach generally assumes that central government agencies, local businesses and regional community leaders can bring different knowledge and expertise to partnerships that will foster greater regional development. In New Zealand, there is a strong consensus for the principle of people-based policies. New Zealanders have a strong commitment to education, for example, although there are reasoned differences of opinion about what policy changes could raise the educational achievements of those young people who are currently leaving school with few qualifications and disengaged from further learning. There is also a strong consensus about the principle of community-based policies, although with differences of opinion about how extensively it should be applied. How far into some of New Zealand’s less populated areas, for example, should the country’s current investment in ultrafast broadband or transport networks be financed? There is less consensus about the principle of place-based policies. One view argues that there are strong economic forces causing the strength of some regions and the decline of others and that central government should not seek to help the latter because this will only take resources away from strong regions, to everyone’s detriment. One version of this argument emphasises the importance of large cities in knowledge-based economies, suggesting that investment in Auckland should be the main priority. Another view argues that all regions can participate in a knowledge-based economy, but that different approaches are required in different parts of the country. This view recognises that effective policies for Auckland will not be the same as effective policies for Gisborne, New Plymouth, Westland or Invercargill, but argues that all regions need effective policies for their economic wellbeing. The formulation of effective, knowledge-based policies in this view requires healthy working relationships between central and local government with the close involvement of local business and community leaders. If central government is to pursue effective place-based policies, it will require a strong local government sector confident in its ability to understand and contribute to the economic wellbeing of its communities. This is not as straightforward as it might sound; indeed, there is considerable suspicion in central government circles, and even some nervousness in local government circles, about the capabilities of city and district councils in this arena. This restriction in vision probably means very little for the darkly shaded regions in the maps reproduced above. Prosperous regions are always able to build on their own momentum to work with central government to develop their potential further. For the lightly shaded regions, however, population losses and business closures mean that the resource base for their local infrastructure and public services is shrinking. A narrow focus on these core functions will not be enough to reverse the decline; instead, action on behalf of these communities will require a clear evidence-based vision for social, economic, environmental and cultural well-being. This issue is also important for the rebuild of Christchurch. The map shows that the population of Christchurch fell between the two census dates, but that the districts around the city are among the fastest growing in the country. 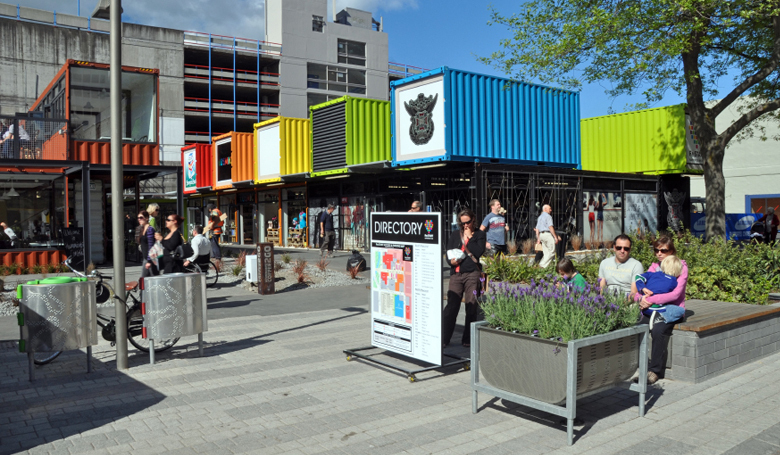 The scale of investment in the rebuild is a unique opportunity for central and local government leaders to promote the social, economic, environmental and cultural well-being of Christchurch communities, in the present and for the future. Paul Dalziel has been Professor of Economics at Lincoln University since 2002. He works full-time in the university’s Agribusiness and Economics Research Unit (the AERU). His research focuses on New Zealand economic and social policy, with a particular interest on regional development. 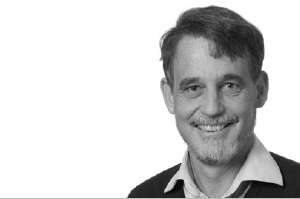 Paul has published more than 100 refereed publications; his most recent book, co-authored with Caroline Saunders, is Wellbeing Economics: Future Directions for New Zealand, published by Bridget Williams Books in 2014.